Der Artikel Vincent And Theo (1989) (UK Import) wurde in den Warenkorb gelegt. Drama / Biographie, 134 Min. The eternal struggle between madness and genius takes its toll on the brothers Van Gogh in this "luminous" (LA Weekly) masterpiece from Academy Award-nominated director Robert Altman. 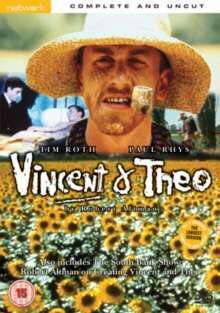 Tim Roth and Paul Rhys give "stupendous performances" (Rolling Stone) in the roles of tortured artist Vincent and his brother Theo in this "beautiful, disturbing and powerful film" (Screen) that is "as rich and tactile as a Van Gogh painting" (New York Post). In life, he was impoverished, his work largely ignored; yet today, paintings by Vincent Van Gogh fetch millions of dollars at auction. This supreme irony is laid bare in the passionate story of an obsessive artist driven by inexorable demons and his alternately devoted and despairing younger brother, who seems unable to live with him... or without him. Lexikon des Int. Films: "Keine eindimensionale Künstlerbiographie, sondern eine anspruchsvolle, ebenso verstörende wie faszinierende Auseinandersetzung mit der Wirklichkeit sowie der Wahrheit des künstlerischen Abbildes. Sehenswert."